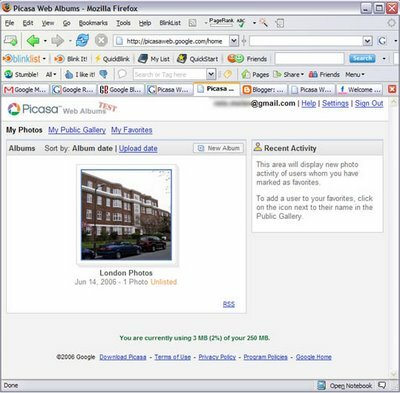 Hot on the heals of Picasa for Linux comes the Picasa Web Albums Beta. This is a nice offering, clearly targeted at photo sharing sites like Flickr. Is it a Flickr killer? Not yet, but it does do what Google does best, in that it provides a clean and simple way to store, view, and share content -- in this case, photo content. Once you've been accepted into the current test, you'll be allowed to download the newest version of Picasa that will let you upload your existing images directly to your Web Album. Google currently provide 250Mb gratis, with the possibility of upgrading this to 6Gb. Once online, you can sort your pictures into albums, which you can choose to share or keep private. 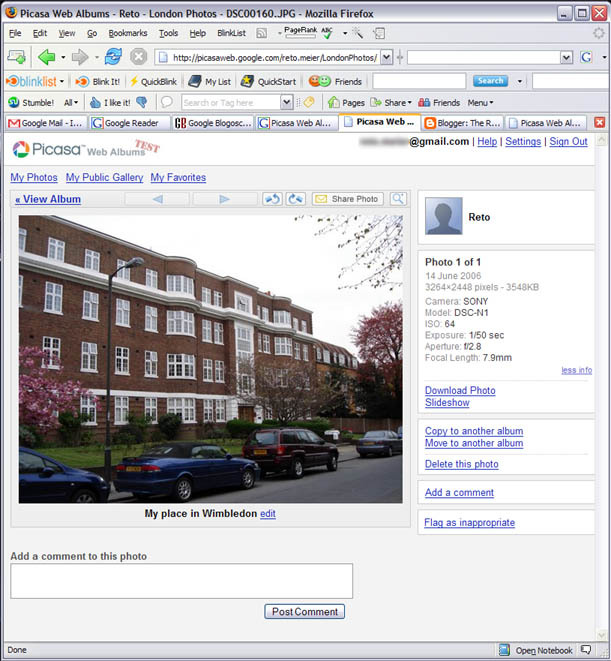 Shared albums can be viewed and downloaded by other users who know your Picasa URL (http://picasaweb.google.com/[Google Username]), like this test user. There's currently no way to search for people of images. Within your albums you can view slideshows, zoom and rotate images, or download them into Picasa. You can also caption or comment on your images. Socially its in its early stages, with no labeling or searching available -- however RSS feeds are provided for users and albums, and you can flag a user as a 'favorite' that will then track any new additions to their online albums. Overall it is a solid start with a simple and elegant interface. The Picasa blog post says "Of course, there's a lot we want to add and improve..." So I expect more to come before too long.